Mayor William Miranda Torres with the mayor of the municipality of Chía, Leonardo Donoso (center) during last week's trip to Colombia. Mayor William Miranda Torres with the mayor of the municipality of Chía, Leonardo Donoso (center) during last week’s trip to Colombia. The municipality of Caguas headed a commercial mission to Colombia last week that produced some 60 business meetings and potential future business opportunities, city officials said Tuesday. The Caguas Department of Economic Development and its entrepreneur support programs, help the town’s entrepreneurs to consider exporting their products and services, he said. “Similarly, we went looking for options and projects that are of benefit to all parties. Collaborative agreements with other cities or countries are important for the economic development of our city and region for their contribution to the efforts to increase economic activity,” Miranda-Torres said. The meetings held in Colombia last week included visiting Google’s headquarters for the Caribbean and Latin America to share information on projects aimed at promoting science and technology. 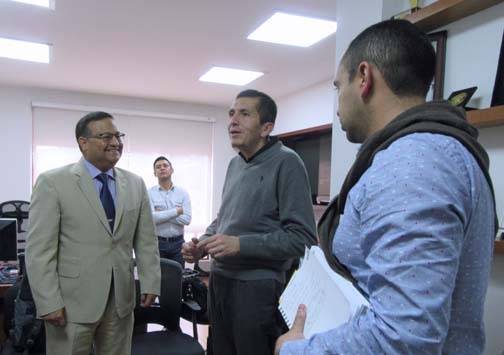 Miranda-Torres also met with the mayor of Chía, a municipality on the outskirts of Bogotá with characteristics similar to Caguas, with whose mayor he discussed issues of governance and multisectoral efforts, among others. The group also visited the Maloka science and technology park, whose experience can be of great help to the C3Tec operation in Caguas, he said. Caguas entrepreneurs, meanwhile, had the opportunity to present their products and services and learn of Colombia’s offers for their business areas. Now, participants will send their quotations and business proposals, as well as follow-up on their contacts to formalize the talks begun last week. Hey Buddy!, I found this information for you: "Caguas concludes productive trade mission in Colombia". Here is the website link: https://newsismybusiness.com/concludes-productive-colombia/. Thank you.